Myths are fascinating stories that become even more intriguing when we realize that they can reveal intimate truths about ourselves and others. Jean Shinoda Bolen brings the Greek pantheon to life as our inner archetypes and applies the power of myth to our personal lives. Once we understand the natural progression from myth to archetype to personal psychology, and realize that positive gifts and negative tendencies are qualities associated with a particular goddess within, we gain powerful insights. Depending on which goddess is more active within, one woman might be more committed to achieving professional success, while another more fulfilled as a wife and mother. 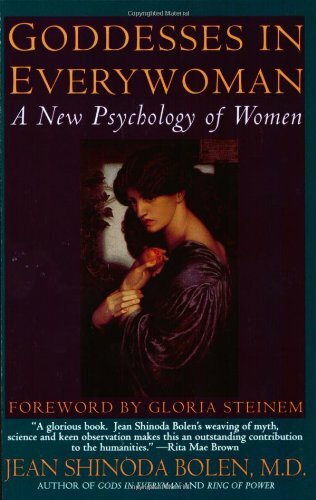 Bolen teaches women how to decide which qualities to cultivate and which to overcome, and how to tap the power of these enduring archetypes to become a better heroine in their own life stories. Jean Shinoda Bolen, MD, is a psychiatrist, a Jungian analyst, and an internationally known author and speaker. Her books include Goddesses in Everywoman, Gods in Everyman, and many others. She is a distinguished life fellow of the American Psychiatric Association and was a clinical professor of psychiatry at the University of California at San Francisco. She lives in Marin County, California.